1.4 FD Laser Canons are crew operated emplacement guns so large that they cant be moved by hand. They are long range and pack quite a punch. The 1.4 FD Laser Canon is the rebellions second support unit and is ideal for forces that need a little help punching armor or guarding an area. The 1.4 FD Laser Canon is a stationary weapons platform, its primary job is putting out a consistent amount of firepower turn after turn in a focused area. 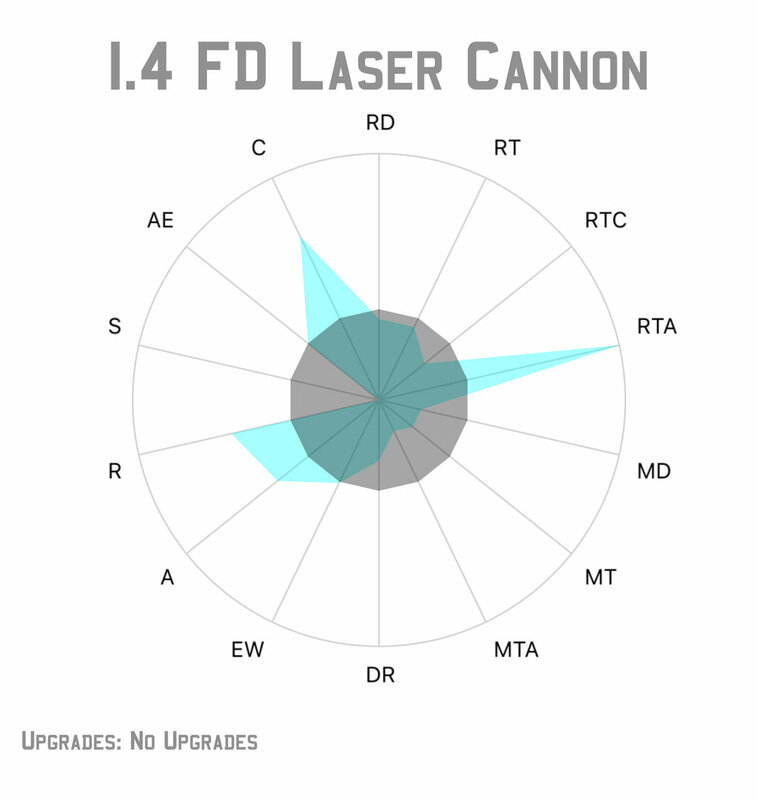 The 1.4 FD Laser Canon is quite durable with 6 health, and its damage is slightly below average (by 0.375 points). However the long range of the weapon means it will get more attacks through out a game and its high attrition value means it will need to take 6 wounds before you slow its damage dealing. So although its turn by turn damage is a little low, over the course of an entire game its efficiency is actually very high. It also brings long range Impact to the Rebel forces which is a welcome addition. The Laser Canon also has the new keyword Sentinel meaning it can use its standby tokens from a much greater distance, increasing its opportunity to take the optimal attack each round. The 1.4 FD Laser Canon has a Generator and a Comms upgrade slot. At 70 points it has some room to upgrade before it starts to become inefficient and most people will want to upgrade it. The most common build for the Laser Canon other than no upgrades is an Overcharged Generator to improve the damage from 3.125 to 3.75 and increase Impact from 2 to 3. Because the generator exhausts to add the the damage and Impact most people also pair it with an HQ Uplink which allows you to activate the Laser Canon when you need it as well as to increase the efficiency of the recover action that you will need to take for the generator. However using the generator and recovering is slightly less efficient than aiming, The Laser Canon with an aim token is expected to do 4.08 damage with Impact 2 while an Overcharge Laser Canon does 3.75 with Impact 3 doing significantly more damage to armor. The Barrage Generator is also a valid option on the laser canon, it is used in the same way as the Overcharged Generator but it adds .75 damage instead of .625 and adds suppressive instead of the extra Impact 1 - it just depends on what your army will need more help against - troops or armor. also keep in mind that Emplacment Troopers follow all of the rules of regular troopers in addition to the additional rules of Emplacement Troopers. So the Laser Canon can capture objective and even deploy via the Rapid Reinforcements condition card. Because the Laser Canon is stationary its tactics are pretty simple, however they must all be figured out before deployment which is the critical part. In general the 1.4 FD Laser Canon is best deployed where it can defend an objective - ideally in a location it can also claim an objective (for example Intercept the Transmissions and Major Offensive give it a place it can deploy and claim an objective from). Once the game has begun the Laser Canon is going to sit in one place and put out damage. On turns that it cant take a shot immediately it can stand by and wait for a unit to come into its extended stand by range. However if you are using the HQ Uplink build you will rarely use stand by as you will be able to control when it activates each turn. The most critical part of getting the most out of your Laser Canon is picking the appropriate target at the appropriate time whether that is finishing off an injured unit, punching some damage into a vehicle or suppressing an opponents crucial troops. When playing against a 1.4 FD Laser Canon how high of a threat it is to you and how high of a priority it is depends on your list composition, terrain, and scenario. If terrain and objective placement permits, you could go an entire game without it contributing due to immobility and LoS blocking terrain. However if it is in a position where you cant ignore it, the best way to deal with it is to focus fire on it. It is so large that it is unlikely to get cover, and its action economy means it is unlikely to take a dodge. which means that you can expect two average units to destroy it in one turn, or one average unit to destroy it in two turns. Don’t leave it to do its job though or it will give the opponent a significant attrition lead.